English National Ballet and English National Ballet School are moving together to a new world-class home at London City Island. This transformational move will give us unprecedented space to develop world-class artists and create outstanding ballet, which we will share with more people than ever before. Our home will be the cultural anchor in London’s newest neighbourhood, London City Island. 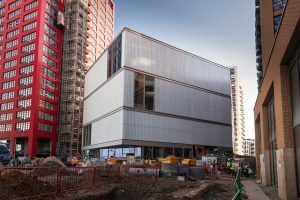 We will have excellent transport links, served by the Jubilee and DLR lines at Canning Town – 20 minutes from central London and only five minutes from Stratford, where the new Sadler’s Wells, V&A and London College of Fashion are opening. Once Crossrail opens in late 2019 there will be another fast link to Canary Wharf and Stratford. Our new home has been designed by award-winning architects Glenn Howells Architects. At 93,000 square feet, it is four times the size of our current buildings. 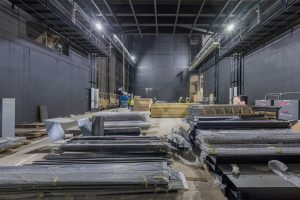 These world class facilities will not only fulfil our needs now, but for generations to come, inspiring and developing the dancers, choreographers, costume-makers, musicians, participants and audiences of the future. 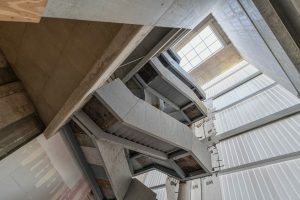 English National Ballet School will have its own dedicated part on the 4th and 5th floors with world-leading facilities for students including three rehearsal studios, a lecture theatre, their own gym and green room. There are built in windows from the School into the Company’s rehearsal studios, giving students a daily insight into class, rehearsal and the creation of new work. The School have their own lecture theatre, rehabilitation facilities, gym and green room. You can support us and our work by making a donation towards the essential finishing touches we need to make each new space work. Join in and help us make this extraordinary new building a creative hub for current and future generations.